This report is well overdue as I went on this course during the summer, but better late than never! 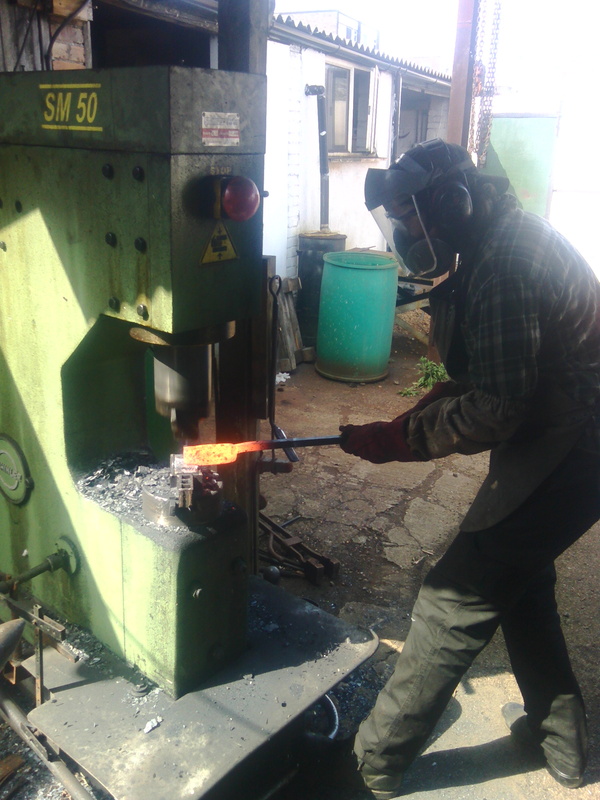 I went to South London to learn how to pattern weld steel under the excellent tutelage of Owen Bush. We had learnt how to do the weld by the end of the first of the three days, and the rest of the time was spent practising the method and increasing the layer count of the billet. This sounds somewhat repetitive, but honestly the work needed constant concentration and attention to ensure that everything was optimised to give a good weld. Not for Mr Bush of course, he was welding things with a devil-may-care ease, but the rest of us really sweated to get our billets! One of the most exciting bits for me was exploring Owens hundreds of metalworking tools and getting to use the power hammer on the higher layer count section of the blade. I have always wanted to use one and I was not disappointed, its quite a beast! 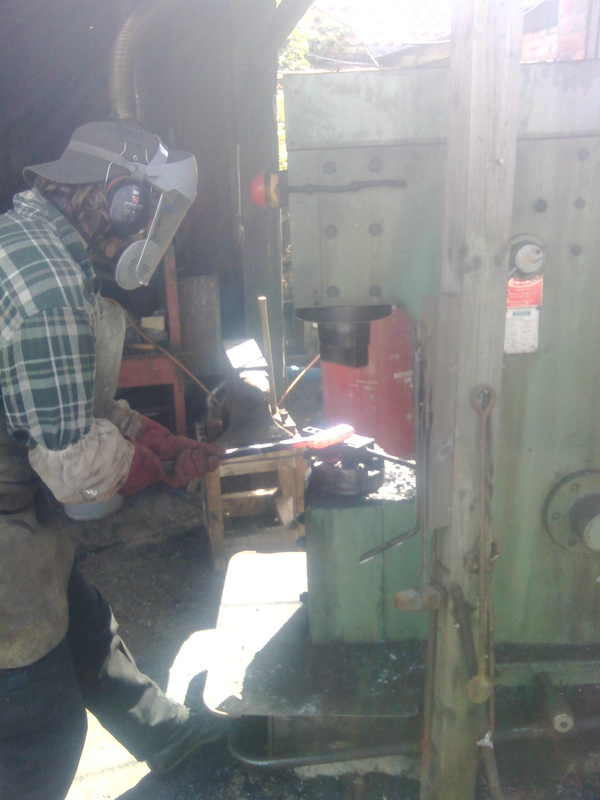 It saved a huge amount of elbow grease though, we welded our first billet by hand with the hammer and the second on the power hammer, and it increased the welding and folding speed about tenfold. I now desperately want one! Here are some shots of my finished blade blank. 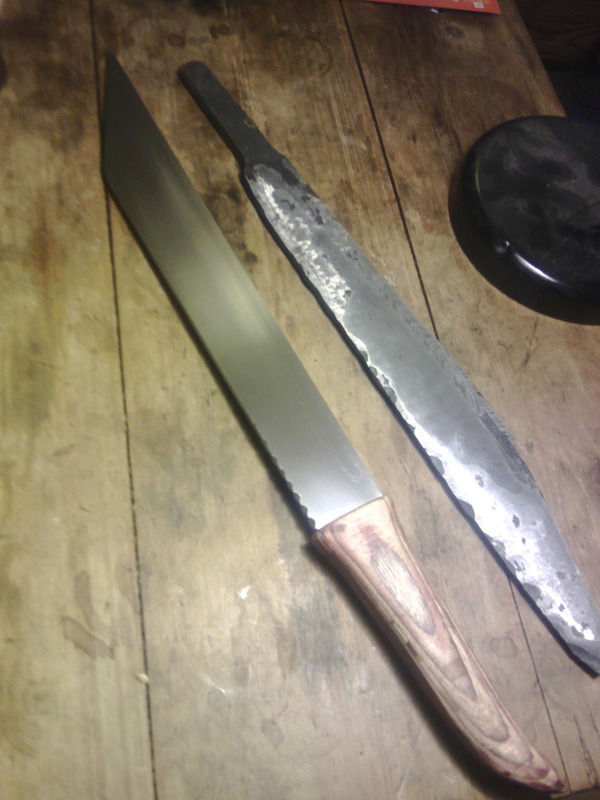 I forged it out into a rough seax shape to maximise the amount of material in the finished blade, as I want a meaty shortsword style seax. 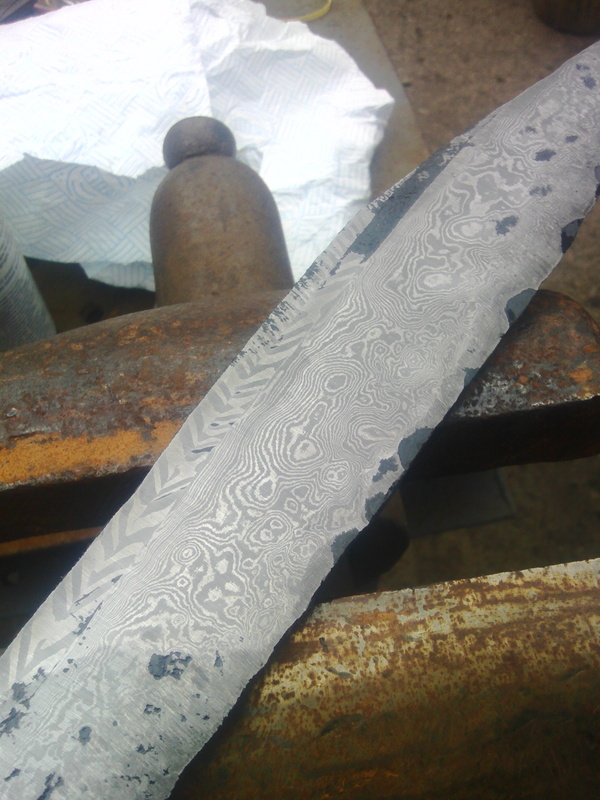 The body of the blade is random pattern damascus but I have sadly forgotten what the layer count was, but I think it was in the region of 200 layers. On the final blade, the hammer blows create a wood-grain effect that I have always loved to see in steel, even though it is the easiest pattern to make. The nasty scaly bits of the billet are in fact nasty scale, as this is straight from the forge with only a section cleaned and etched so that we could all bask in the glory of our efforts ;). 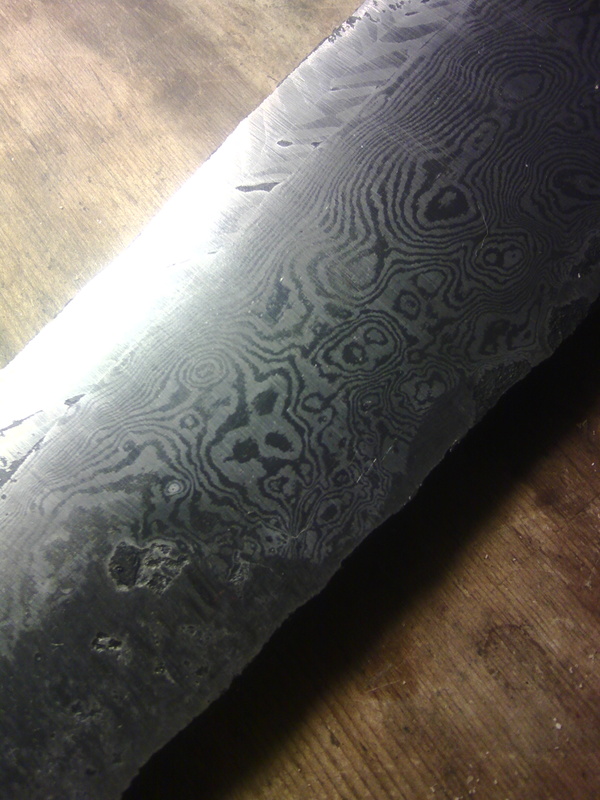 The spine of the blade has a chevron pattern created by twisting a stacked billet at welding heat to form a spiral within the steel, and the cutting it in two and aligning it so as to create the pattern. I found this incredibly hard to do, I think I was being impatient during the heating, and the billet sheared three times whilst I was twisting it. Not a big deal but it meant I had to make the spine a little thinner to compensate. 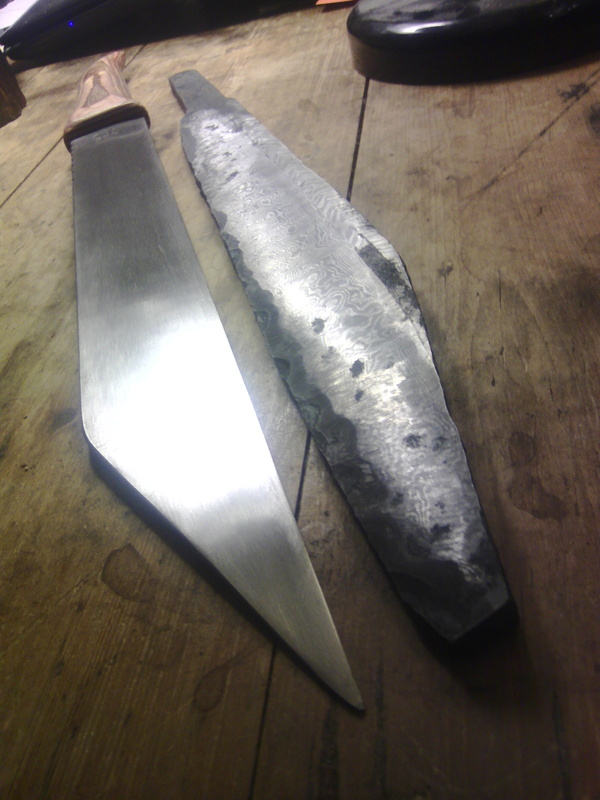 Here is the billet lined up with my apprentice seax, they are of a size but the forged one is about twice as thick at the moment which means that I can really play with the taper when I grind it to finish. Here’s hoping that the welds don’t crack when I quench it! (No, seriously, cross your fingers for me! ).